If you’re planning on taking the plunge and taking to two wheels there are some important things to consider. Before you even pick your scooter or motorcycle, you’ll need to make sure you have the right safety clothing and security equipment ahead of hitting the road. 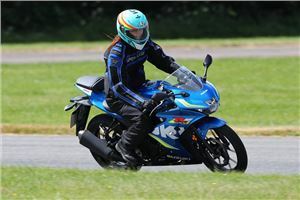 Not only is a helmet the most important piece of safety equipment in the event of an accident, but it’s also a legal requirement if you want to get on two wheels. There are plenty of choices out there, but for an entry-level helmet — you can't get much better than the AGV K-3 SV. 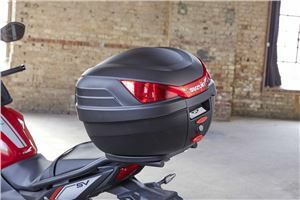 The stylish helmet won't break the bank, plus it has a four-star Sharp rating and comes loaded with an inbuilt sun visor and AGV Share Bluetooth system compatibility. If you want something a little more out of the box, and similarly priced to the AGV helmet (pictured), then a character helmet is the way to go. 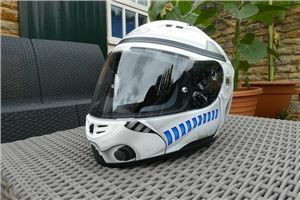 And, in our humble opinion, HJC's new CS-R3 Stormtrooper helmet is up there with the best of them. There's also a Darth Vader option, or if you don't quite like the Dark Side, there's Monster Inc's Mike Wazowski, Car's Lightning McQueen and Iron Man editions to name a few. 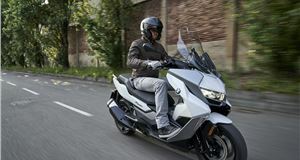 TomTom’s latest motorcycle-specific sat nav ’is aimed at those who want to tour or take the long way home. It offers all of the usual sat nav ability to get you to your destination in the shortest possible time or most direct route, but it also comes with features that allow you select more scenic or challenging roads. As you'd expect with a TomTom, there’s all the usual traffic and route information available to help you avoid jams. It tells you where safety cameras are positioned and, in most cases, if you’re in an average speed zone and what your calculated average speed is. Built-in WiFi also means you don’t need to faff around with wires when you want to update the Rider 550’s maps and software updates either. 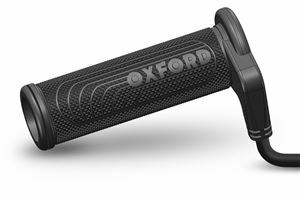 Oxford Advanced HotGrips feature nine heat settings with LED lights to indicate the level. The intelligent heat setting memory function stores the previous heat setting and defaults to this at power up. The heat controller uses a sealed-for-life welded case construction for long-term durability and weatherproofing along with weatherproof power connectors to further protect the HotGrips against the elements. If you forget to turn the switch off, it will do it for you so you don't run your battery flat. The grips also have ergonomically engineered surface structures to optimise riding performance. Thicker rubber in areas of maximum wear ensure high levels of grip and vibration absorption. Thanks to their unique expandable design and foolproof wiring loom, HotGrips are extremely easy to fit. Make sure you choose the ride type of HotGrips for your type of motorcycle. Choosing the right pair of gloves, along with your helmet, is very important. 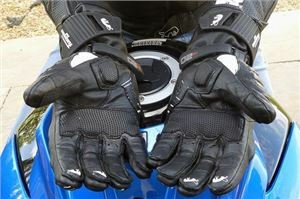 A well-fitting, comfortable pair can improve your riding experience, as well as protecting your hands from the elements. Glove manufacturers have specialised options for different riding styles, types of bikes, weather conditions, level of protection and budgets. What you need will depend on all sorts of factors, too much to go into here, but it's definitely important to do your research and try gloves on before you buy any. You don't want to buy a size that's too big and then find you can't comfortably or easily grip the clutch. For female riders, finding gloves that fit properly can be a bit tricky, but the Furygan TD12 motorcycle gloves fit perfectly for our small hands. 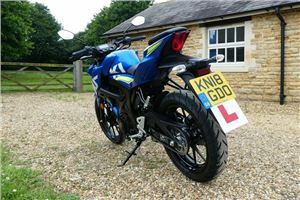 If you’re on a provisional licence (even if you've passed your CBT, but no extra requirements), you’ll need L plates front and rear by law. 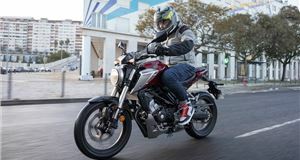 If you buy a new bike from a dealer they will probably include L plates and fitting in the price, but if you’re buying a used bike you might have to get some and fit them yourself. Rigid plates that attach to the number plate at the rear and the suspension fork at the front are cheap, but since most scooters have a nice big flat surface at the front an even cheaper, stick on L plate will do the job. Remember to always display both plates – and it’s even worth keeping hold of a spare in your under-seat storage, just in case. A lot of urban riders commute daily in all weathers but thankfully there is a good choice of durable, warm clothing that can be worn over the top of work or office wear. There are plenty of jackets with removable thermal linings, so if you want something suitable year-round they’re ideal. Textile clothing tends to work better for scooter-riders and it’s cheaper than leather. Waterproofing is desirable, but some riders buy an extra waterproof layer to keep their textiles dry – whatever you choose, check safety ratings to ensure you’re getting the best you can afford. 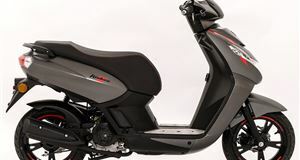 Most scooters have a couple of decent storage bins either in the front fairing or under the seat – but some don’t. If you’re interested in a traditional naked bike (like the Suzuki GSX-R125) instead of a scooter there’s unlikely to be much, if any storage, at all – so some additional aftermarket boxes or panniers might be handy. 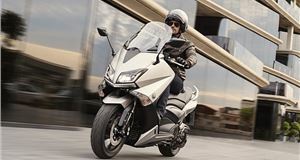 Top boxes, panniers, tail bags, tank bags and dozens of other options are available to accommodate everything from phones and wallets to full-faced helmets, with prices ranging from about £5 for a simple textile bag to hundreds for big, professionally fitted top boxes. 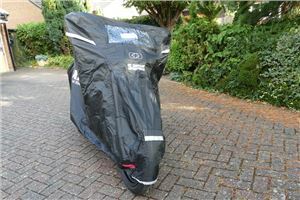 If you have a garage at home you might not think a bike cover is worth buying, but there are plenty of options to keep your bike dry when it’s parked out and about. The Oxford Stormex bike cover (which is covering our Honda CB125R in the photo) features a tough outer layer with reflective panels that increase the visibility at night. The soft inside material helps to protect your paintwork from scratches as well. On many of the covers, there's an elastic strap underneath the frame to keep it tight on the bike, pockets and cut-outs for locks and solar chargers and holes at the bottom for passing a chain lock through. It's a great stormproof cover, just make sure you get the right size for your bike. Bikes are notoriously easy to steal. This is even more of a problem in urban areas, particularly for light, easy to lift scooters. 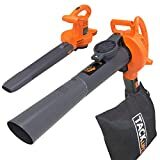 A heavy-duty chain attached to a solid object will do a lot to deter a thief, but it's a good idea to get an alarm and a tracker if you can afford it to be on the safe side. 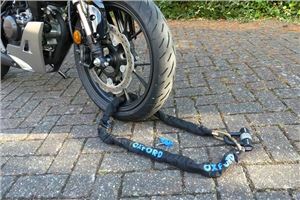 You can get various sizes of Oxford chain locks, ranging from the light chain locks to the £130 Monster Chain (which is currently reduced to £68). 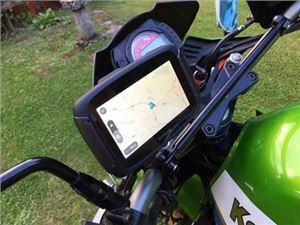 Navigation on a bike is arguably more difficult than in a car, so if you plan to ride in areas you aren't familiar with and don't want to splash out on a bike specific sat nav like the TomTom Rider 550 — then a phone mount should do the job. There are lots of cheap options from various sellers on eBay and Amazon, but we recommend the cheap and cheerful Cheeroyal Universal 360° if you don't want to spend too much. 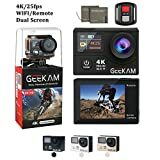 It's a simple case of getting Waze, Google Maps or whatever else you might use for navigation up on your mobile phone and putting it into the phone case mount. 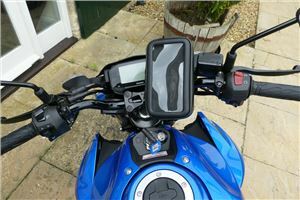 The mount wraps around the handlebars and can be swivelled horizontally or vertically - although, as the picture shows, it can tend to block some of the bike's display screen. The case is waterproof and you can still click your touchscreen through the screen, but wearing gloves does make this hard to do.